Welcome to the online catalogue for the March 2019 Premier Live Internet Auction. This exclusive live auction will feature over 500 live auction lots of vintage and modern baseball memorabilia. The auctioneer generally sells 75 lots per hour in numerical order per the catalogue. Interactive Online Bidding will be available to all registered Hunt Auctions bidders. This bidding platform will provide Hunt Auctions bidders the ability to participate with real time interactive online bidding during the live auction. The interactive bidding will be powered by Invaluable and may be accessed via a link that will be available closer to the date of the auction. Bidders must have a valid Hunt Auctions username and current email address to bid interactively online during the auction. Please note, unless you have already received premiere bidding status and plan to bid live online for item(s) totalling $5,000 or higher, you will need to be preapproved as such. 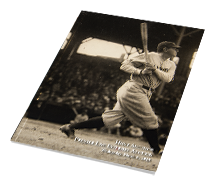 Lots 124-734 is a collection of historic baseball photography that is simply astonishing. The client who has amassed this collection spent over 30 years doing such with an acutely keen eye towards the very finest original imagery. Long before these photo types were being professionally graded or achieved five figure pricing this collector sought out the very best images within the market. Based on subject, photographers, rarity, and quality this particular collection must absolutely be considered among the finest ever offered. We are honored to present this very special offering to a collector who truly achieved their goal of excellence, mission accomplished. *Please note: Bidding options will include online proxy pre-bidding, interactive online live bidding through the Invaluable platform, and live telephone bidding.